We learn by observing, experimenting and analyzing, as part of a human evolutionary process that serves ethical ideals. How do we find meaning in connection with others, working collectively to benefit society, without the need of a belief in God? There is, on the one hand, a notion that if you suffer in this lifetime, God will absolve you of sin and you will reach heaven. This idea particularly serves those who are long-suffering, and those who seek vengeance for being wronged here on Earth. On the other hand, others wonder if that notion means that God is a white racist, since non-whites seem disproportionately affected by suffering. In a world in which whites have tended to benefit from housing and employment and environmental securities that make it easier to lift themselves from poverty and enslavement, many have decided they are “done with that God” of fear and punishment, of judgment that seems to be harsh and mean-spirited, governed by impossible standards, where superstition seems to give cosmic responsibility for all things. Religion is helpful for many individuals and communities. But a growing number of people of all backgrounds are “nones,” atheists, agnostics, and those who simply don’t care whether there is a life after death, or a heaven or hell, or a God or spirit. The vast majority of religious “nones” (78%) were raised as a member of a particular religion before shedding their religious identity in adulthood, according to a 2016 Pew Research Center report. In fragile and tenuous times, how do we support progressive values without the base of support that traditionally has come from religious institutions? How do we create a secular community around social justice and social action? One answer began in Minneapolis in Fall 1916, when Rev. John Dietrich was called to set a new fire in a community apart from its Christian faiths. Beyond donating money — beyond simply offering a “rejection” of religion, with a spirit of “commitment to” something — how could independent thinkers gather together in a like-minded spirit of offering positive energies to good? And, importantly, how could deeper conversations transpire, even in the uncomfortable spaces? In both a forum and a talk last week, Rev. 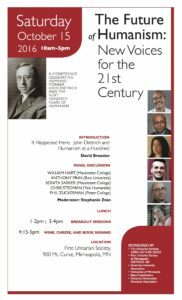 Breeden outlined the goals of Humanism — the foundation of building fellowship even for individualists, in a world of constant change — and what a conference on October 15, 2016, aims to discuss. At the October 15th conference, we gathered together — Humanist and curious, Black Freethinkers and feminists — to discuss how we might use our sense of awe and wonder in pursuit of social justice and action for the better world to which we aspire. The Future of Humanism: New Voices for the 21st Century (click for overview and summaries) was moderated by Stephanie Zvan (Humanist Hour Podcast) and Dr. David Breeden (Sr. Minister, FUS) as they query distinguished scholars and authors from around the country about the future of humanism. 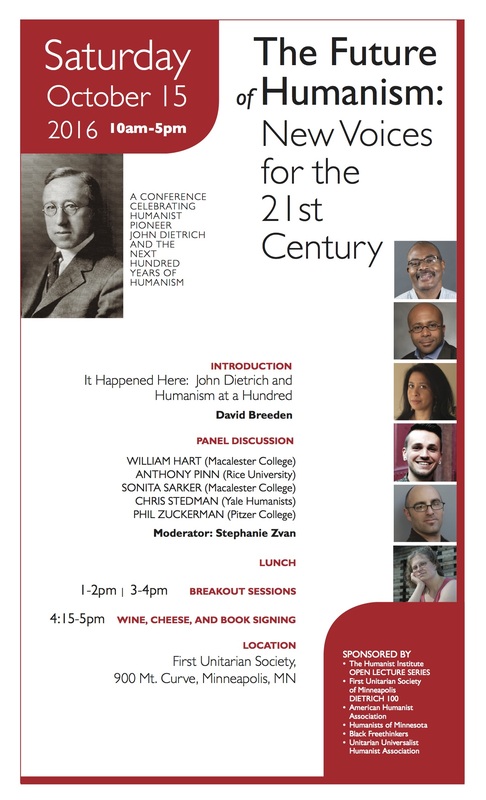 Humanist theologian and American Humanist Association Board member Anthony Pinn of Rice University will be joined by professor of religion William Hart and feminist scholar Sonita Sarker, both of Macalester College, theorist of secularism Phil Zuckerman of Pitzer College, and Yale Humanist Chaplain Chris Stedman. This overview excerpted from “The Power of Liminal Thought” talk, and a forum about the autobiography of Anthony Pinn, delivered by Rev. David Breeden, First Unitarian Society, October 9, 2016. The Humanist Pulpit, excerpts of FUS ministers since 1916, including talks such as "What's wrong with the world?" (1922), "On self-protection and the bomb" (1961), "An accident called intelligence" (2015).